The Joe Policastro Trio returns to Brothers Drake on Wednesday, February 28th at 8pm for a FREE Jazz Wednesday performance. 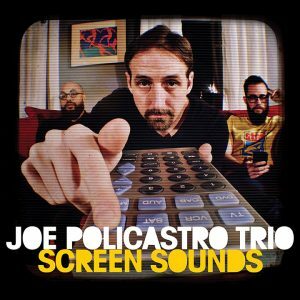 Consisting of Joe Policastro on bass, Dave Miller on guitar, and Mikel Avery on drums, the trio will be kicking off a mostly-Ohio stint of their tour in support of 2017’s Screen Sounds, which is their third album, all of which have been released on JeruJazz Records. Here is a concise description of their approach: “While firmly rooted in jazz, the Chicago-based band’s open-minded, inclusive nature also brings rock, pop, old-school funk, soul, Brazilian, and free improvisation to the surface while still keeping the aesthetic of an acoustic trio intact.” After albums comprised of a variety of pop tunes (2016’s Pops!) and the music of West Side Story (2013’s West Side Story Suite), Screen Sounds is made up of re-workings of a wide selection of music from film and TV soundtracks. Keep reading for my thoughts on this ear-pleasing release. The album opens on a dramatic note with the main title of Akiro Kurosawa’s Yojimbo, as Avery’s military cadence on the drums is soon joined by Miller’s distorted guitar and Policastro’s bowed bass for a series of stops and starts, twists and turns, and atmospheric solos. The proceedings then take a mellow turn toward pop with “Everybody’s Talkin’ (from Midnight Cowboy), and the extended rootsy rumble allows all of the players to open up before slowing to a peaceful stop. The yearning of “Nadia’s Theme” (Theme from The Young and the Restless) is ably handled by Miller’s versatile guitar, with sparse backing from the rhythm section heightening the moment before it explodes in slow-motion. The Cool Hand Luke Main Title is another subdued stroll, with Avery’s brushwork well-suited to guide the accelerating shuffle to another gear, where Miller’s nimble melodic lines shine, before Avery adds an understated solo. Policastro’s striking bass part opens the loping “Twin Peaks Theme” in stark fashion, and he and Miller contribute expressive solos that come and go around cohesive group passages. The often mellow “Angela” (theme from Taxi) finds Avery laying down a nasty funk groove under Miller’s fluid melody, and Policastro works out an expansive, earthy solo to excellent effect before the band rides the groove home to a satisfying finale. The “Main Title and Love Theme” of The Godfather is treated to an epic rendering, with Policastro’s bowed bass darkly establishing the melody before his compatriots join to create a bluesy scamper. This setting allows for high-level solos across the board before thrilling hijinks ensue and resolve. “Having An Average Weekend,” the theme from Kids In The Hall, is a fun choice for the album closer, as the 90’s rock romp lets the players let loose and ascend to one more cinematic climax.